The UAE Shark Project is a seperate Ph.D. study being conducted by Rima Jabado on all aspects of shark fisheries here in the UAE. Rima would like to recieve any shark fishery related images which can be done via the below form. Volunteer research assistants are required to assist with the long term research and monitoring program of the ‘UAE Shark Monitoring Project’. 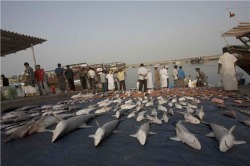 The project is part of a PhD study on the shark fishery in the UAE with a focus on species diversity, distribution and abundance, feeding ecology and the fin trade. The research is focused on four of the seven Emirates in the UAE and all field work will be conducted from Abu Dhabi, Dubai, Sharjah and Ras Al Khaimah. All laboratory work will be carried out at the Marine Biology Lab at the United Arab Emirates University (UAEU) in Al Ain. This is a long term project and volunteers are expected to commit to the project for at least 5 days of field work during the whole period. This is an excellent opportunity to gain experience in shark identification, landing sites and market surveying, dissections, analyzing stomach contents, staging reproductive systems, fishing gear configuration and general data collection skills that can be obtained from participating in marine fieldwork. - Volunteers can also assist in the processing and data analysis of shark stomach contents at the UAEU in Al Ain. - Data entry, equipment cleaning and maintenance and other lab task may sometimes be required. - Conducted 2-3 days a month at various locations (weather permitting). - Volunteers must be comfortable on a small fiberglass boat (up to 10m in length) in moderate sea states. Daily trips will be up to 12 hours long. - Assistants will help deploy fishing lines and nets as well as sample and tag sharks using a catch and release method. Data collected will include species identification, measurements, stomach contents and DNA samples. - Equipment cleaning duties will be shared. This is a volunteer position and is unpaid. Applicants must organize and pay for their own way to the study sites. Alternatively, they can join the project leader and depart from Dubai Marina prior to each survey. - Previous field work experience specifically with fisheries is preferred but no prior research experience is required and full training will be provided. Applicants should send an email introducing themselves to the project leader Rima Jabado at rjabado@uaeu.ac.ae or rimajabado@hotmail.com . The email should include a brief outline of why they would like to participate in this project, which activities they are interested in, their availability (in terms of locations, days of the week, and time) and any other relevant details.